My hometown club. This category probably will be the biggest on this blog, with good reason, as it’s my team. Since 1995 I’ve been a fan of Colwyn Bay, and seen them be promoted & relegated. I’ve travelled hours to see the Bay play, and we are lovely. Rose tinted specs are optional, and I’ll aim to not be biased when I talk about the mighty mighty Seagulls! Anyway, we are one of the longest running clubs in not only Wales, but also the entire UK. Our history has been jumping between minor English leagues & major Welsh leagues, shunning the League of Wales on formation to take our place in the English league system. 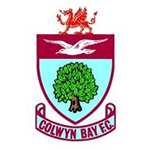 Following exhile, Colwyn Bay had the most successful period, reaching the Unibond Premier Division in 1992, and having a couple of successful FA Cup Runs – reaching the second round in 1995 (losing to Blackpool) and the First Round the next two years (losing to Wrexham & Notts County).